You’re walking in the park when an owner calls “Come” or “Here Boy” to their dog. Not very far away, their dog stands stock­still, ears pricked, wearing a puzzled expression. The owner calls again and the dog glances anxiously from side to side. It’s only when the owner claps her hands that the dog springs to life and runs straight to the owner. It’s likely this dog is suffering hearing loss. 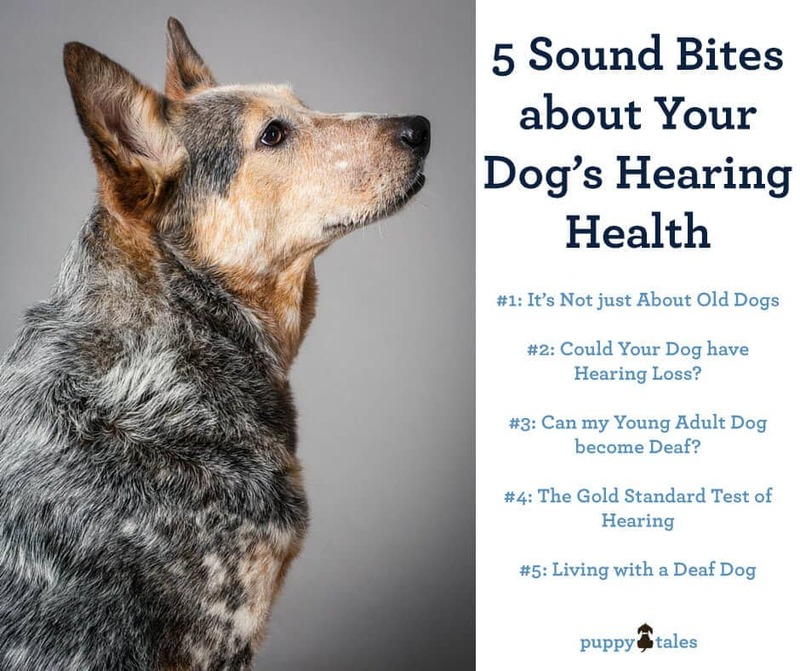 The last full week in September is “Deaf Dog Awareness Week”, so with this in mind let’s look at 5 ‘sound bites’ about deafness in dogs. 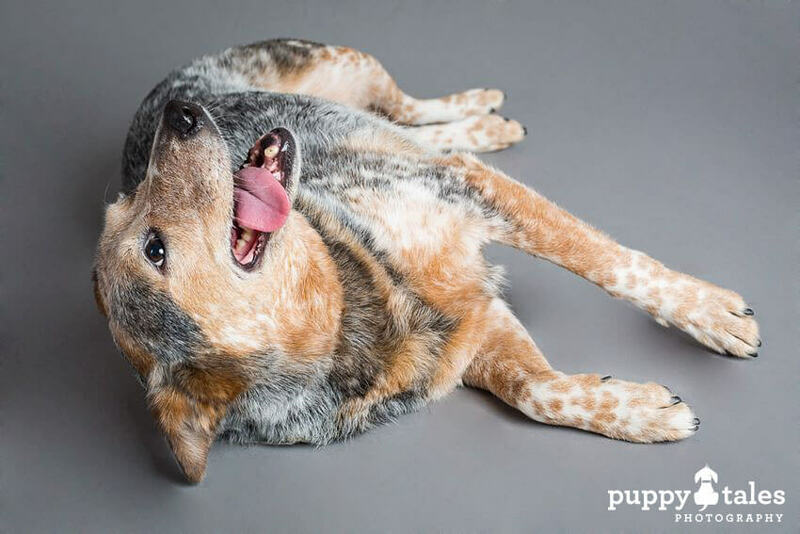 What age do you associate with deaf dogs? Perhaps you assume that deafness in dogs is an issue only for older dogs. That would be incorrect. Just like people, dogs can acquire hearing problems at any age. Of course your average dog doesn’t attend rock concerts or work with heavy machinery, but they can still suffer damage to the delicate hearing mechanism when exposed to prolonged noise or loud sounds. Then there are the dogs with genes inherited from their parents which mean they are born deaf or will lose their hearing at a young age. Hereditary deafness is recognised in over 60 breeds, including the Australian cattle dog, Border collie, Cocker spaniel, Dalmatian, and English setter. Another factor that makes deafness more likely are the genes for a merle or white coat with blue eyes. These pups are deaf at birth, but often hide their disability by reading their littermates’ body language and following their noses to food. It’s only when they are homed and training starts in earnest (but the pup doesn’t make progress) that suspicions of deafness in the dogs arise. #2: Could Your Dog have Hearing Loss? You may joke about “convenient deafness”, but what if the dog isn’t just tuning out but genuinely doesn’t hear your commands? One giveaway is if they don’t materialize for favourite activities such as eating dinner. Test this out by changing mealtime (so they’re not expecting it) and prep as usual. See if the dog hears the kibble cascading into the bowl or the metal spoon dinging on the side of the bowl as you mix. One up side of deafness is the dog may no longer react with fear to the sound of a vacuum cleaner, hair dryer, fireworks, or thunderstorms. If your dog takes an unexpected turn for the better in these situations­ consider that hearing loss could be a possibility. When testing your dog’s hearing, experiment with different types of noise. Banging pan lids together is a favourite, but best done behind the dog’s back. A drawback to these types of test is air movement. Dogs’ whiskers great motion detectors and those pans lids waft air to which the dog might respond and yet they can’t hear. Relying on one sound is not sufficient to reach a conclusion because different parts of the hearing spectrum can be lost – high tones or low tones. The commonest type of hearing loss is due to damage to the delicate hairs in the cochlea of the inner ear, and which sound frequencies are lost depends on the exact location of the damage. As people with hearing loss know, there’s a big difference between hearing a sound and being able to interpret what it means. Think of the untuned radio scenario. You hear static noise but the speech is garbled. This happens with our dogs – they hear a sound but can’t differentiate “Come” from “Sit” or “Fetch” ­ a very confusing world for a dog to live in, especially when they’re expected to obey. #3: Can my Young Adult Dog become Deaf? Age is a major cause of deafness but, just as for people, there are other risk factors. This is nothing to panic about because the risk is extremely low, but some drugs may have the potential to cause deafness. These drugs tends to have specific uses such as shifting fluid for a dog in heart failure, chemotherapy agents, or strong antibiotics used to treat resistant infections. Their use against potentially life­threatening conditions needs balancing against a tiny risk of hearing damage, and the decision to treat made accordingly. One difference between people and dogs is the latter may have a long­term ear infection the owner hasn’t spotted. At the low end of the scale discharge and debris fills the ear canal and muffles sound, at the other extreme an infection in the middle or inner ear can gum up the delicate mechanism and cause profound hearing loss. A human exposed to over 100 dB (a power saw, motorbike, or a train 20 feet away) for 15 minutes is at risk of hearing loss. How much more could our dogs’ hearing affected, when their hearing is so much more sensitive to start with? If you want a definitive answer as to your dog’s ability to hear then they need a BAER (Brainstem Auditory Evoked Response) test. This test is used on newborn babies and is painless; indeed the dog doesn’t even have to be awake during the test. In simple terms the dog wears headphones and listens to a series of clicks. Small electrodes placed on the scalp measure the brain’s response to the clicks. Hey presto, a map builds up of which ear is affected and how badly. But being deaf doesn’t stop Liberty Belle from being cheeky or having a wonderful life. The good news is that deafness alone doesn’t have to impact on your dogs quality of life! With patience, caring and learning different methods of communication, you and your dead dog will still have a wonderful life together. Keep your dog on a leash near roads, as they won’t be aware of traffic or your commands. Use hand signals along with spoken commands (some dogs do appear to lip read when close enough). If you use a training whistle and your dog’s response becomes patchy then consider your dog may have partial deafness, for example they may no longer hear extreme low or high tones. Rather than assuming they are being disobedient, it might be switching to a combination of hand signals and spoken commands will do the trick. So, this “deaf dog awareness week” why not spare some time to assess your dog’s hearing health because deafness isn’t only about older dogs.